“Why can’t I find that person? I know I entered them into my database!” Maybe it is because you know them by a different name than the one you entered for them. We are taught to enter the full birth name for a person, but that person may have changed their surname when they got married, or may have gone by a nickname. If you do a simple search for that married nickname, you probably aren’t going to find them. This is where a great feature called NameFind comes to the rescue. Let’s say you are looking for Mary Smith. 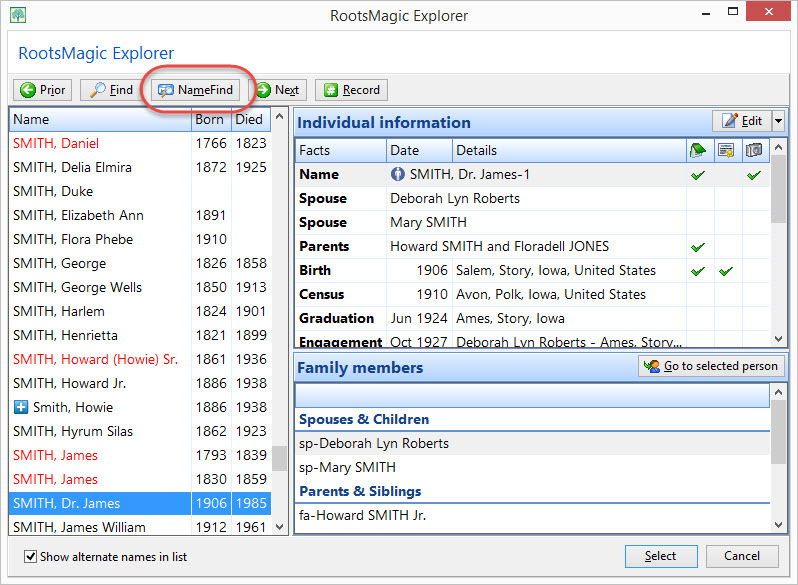 You open the RootsMagic search list (Search > Person List or click the magnifying glass on the toolbar) but you don’t find Mary Smith in the list. Here’s how you do it. Just click the NameFind button on that list screen. 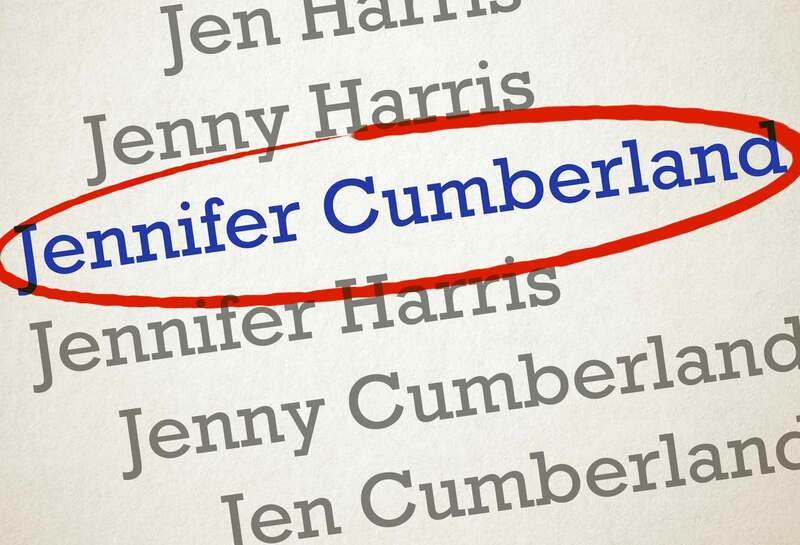 That will open a form where you can enter the name of the person you are looking for. Just type in the name of the person you are looking for and RootsMagic will begin its magic. This screen looks quite simple, but is the gateway to a very powerful search which looks not only for a person entered with that name, but people who have that given name as their nickname, or that surname as a married name. It even has an option to allow close matches, which will let it (for example) find Maria even if you looked for Mary. 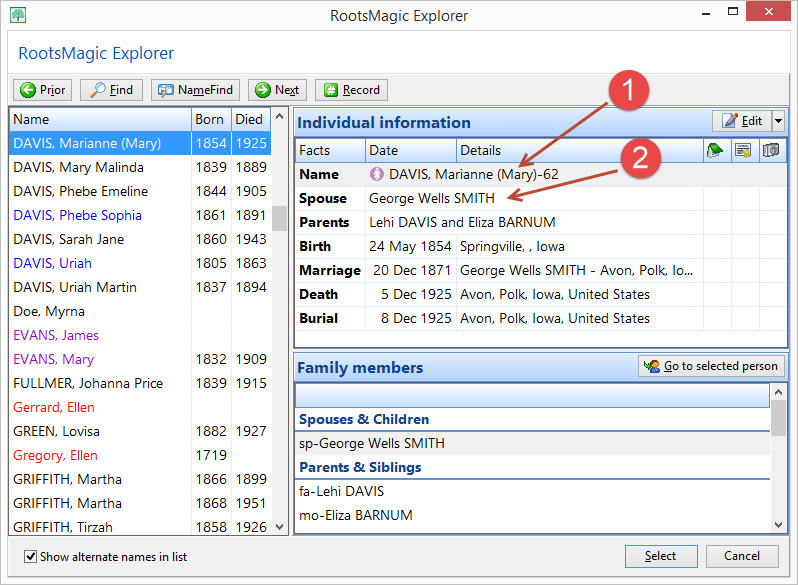 Once you’ve entered the name you are looking for (and clicked OK), RootsMagic will jump to the first person who matches. Notice in this case we were searching for Mary Smith, but RootsMagic found Marianne Davis. That’s because 1) Marianne’s nickname is Mary, and 2) she was married to George Smith. 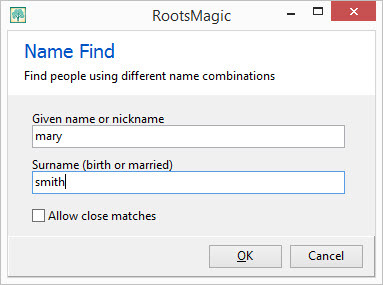 So there you have it- with RootsMagic’s NameFind, you can easily find anyone in your file, no matter what their maiden, married, or nicknames may be! I have been using RM since the beginning. I am not much of an explorer and have barely tapped the potentials. This was an eye opener and works like a charm. I need to go back and read ALL tips and really learn about Roots Magic “the RIGHT way”. Thanks. This tip is great and will be used much. I am just new to RM and hope to find other tips that will help me. Great idea,you people must be searching for new tricks all the time. Have used RM for many years, have read both books from Bruce Buzbee, still finding ‘tips’ that are a wonderful help to my researches and use of RM. Please keep up the good work. For some reason, this is one I’ve been using all along! I’ve got a bunch of ancestors with strange nicknames and multiple spellings of their surnames, so I quickly found this was the simplest way to find them. The tip I didn’t learn until a recent blog was how to use the index on the left to easily get to someone I wanted to look at. I was using this instead. For simple names, it’s unnecessary. For complex names, it’s a godsend! I not evidently use roots nearly as much as I should as I hadn’t seen this before. I do have many people that are listed with different first names in different census’s tho so this seems like a wonderful thing!!!! This hint on Name Find is great. This has caused me some extra search time in the past in the database of 15,000+. I like the new things added to RM, a user from the beginning. Great tip, I have been using RM for many years. Keep up the great work.